You are here: Home | Vegan Thanksgiving Recipes | A Vegan Thanksgiving Stuffing everyone will love — even the kids! 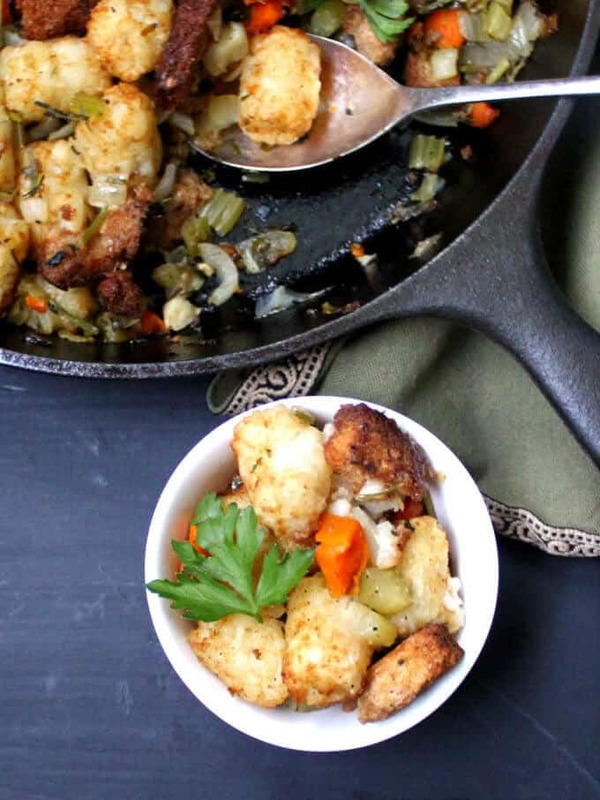 A Vegan Thanksgiving Stuffing everyone will love — even the kids! 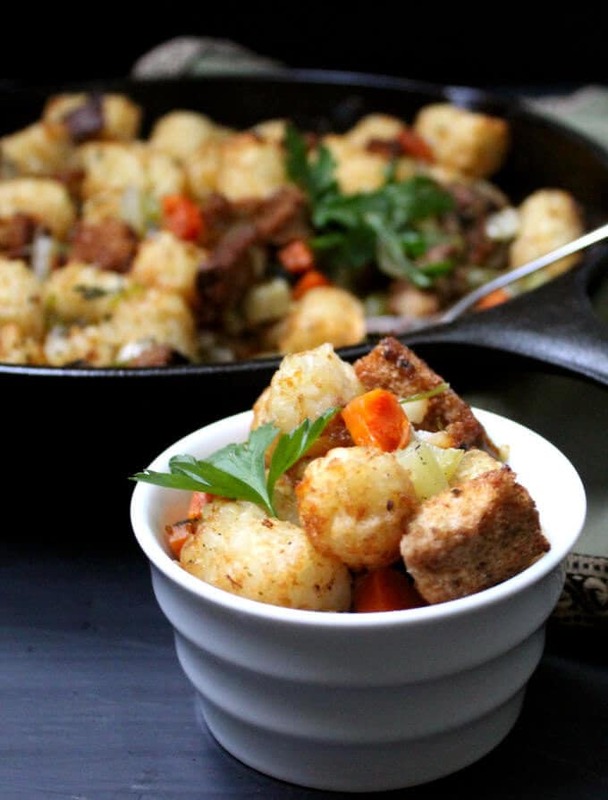 The secret to my perfect Vegan Thanksgiving Stuffing is crunchy, crispy tater tots. This traditional holiday staple gets a fresh, new makeover in a recipe that’s as easy and fun to make as it is delicious to eat. Vegan, nut-free, soy-free and can be gluten-free. 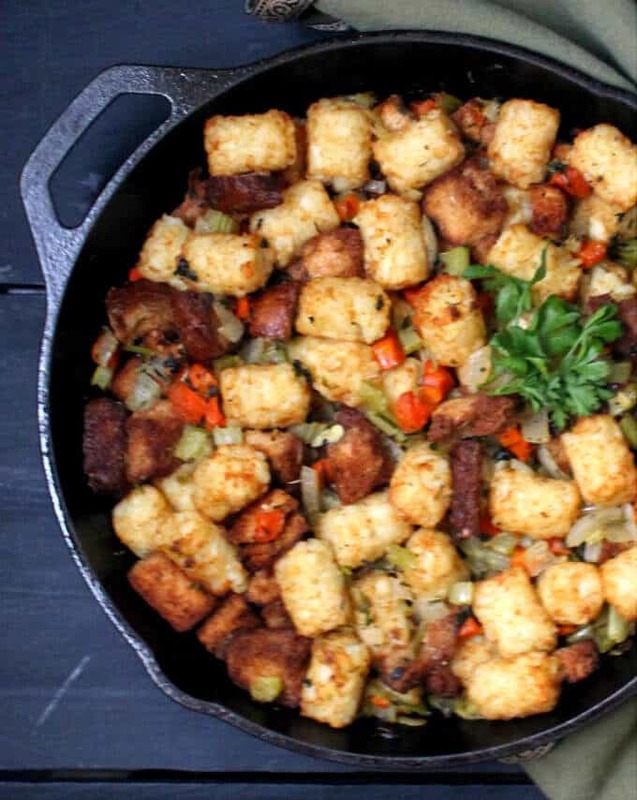 If you ever wondered how to take the “same old” out of your Thanksgiving stuffing and turn it into something fresh, fun and new, I’ve got just the recipe for you: my Vegan Tater Tot Stuffing. I am not a huge fan of stuffing — who is? 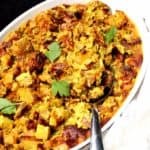 — and since there exist people in my home who have taken the term “picky eater” to a whole new degree, I needed to come up with a vegan Thanksgiving stuffing recipe that we could all love. 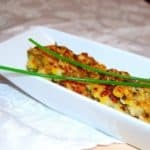 Stuffing is one of the most important dishes at the Thanksgiving table, so what a pity then that it usually elicits groans rather than yums from most eaters. Even on the face of it, there doesn’t seem like there’s a lot to love, especially if that stuffing is going to stand alone and not actually used as a stuffing. 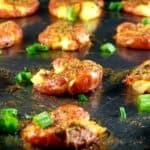 Enter tater tots. Tater tots are a food I had never eaten before I became a mom. But moms are nothing if not flexible and Machiavellian, and when I became one, I had to come up with ways to sneak things into my fussy son’s plate without getting too much pushback. 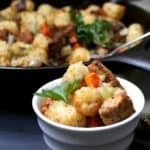 I shared with you my vegan tater tot casserole (it would work great for a Thanksgiving entree) earlier this year, and I know many of you love it and have made it over and over again. This stuffing is just as good, and the best part is, it tastes like traditional Thanksgiving stuffing should — only better. All of the traditional ingredients are here: bread, celery, onions, herbs, and a flavorful vegetable stock tying it all together. But made my way, the bread remains crispy and savory instead of getting all mushed up, and the tater tots add even more crunch and fun. 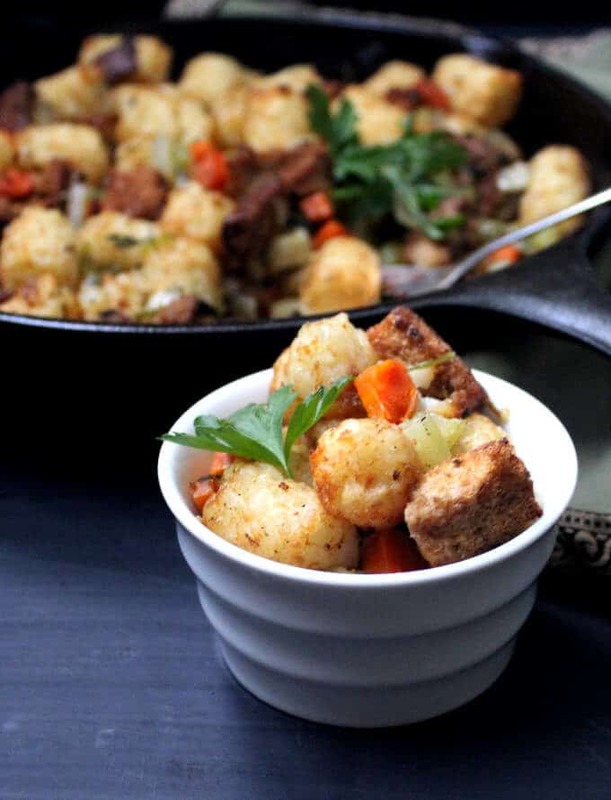 This is an easy recipe: you saute the onions, celery, carrots and garlic, add sage and celery and thyme, pour in the vegetable stock, bung in the bread cubes, and then stir in the tater tots. You do need to dry out the bread cubes in the oven first, and I also recommend baking your tater tots beforehand to ensure the maximum crunch. But those are not labor-intensive steps and SO worth the effort. — The secret to a good stuffing is a good broth. Make my vegetable stock if you want a recipe that’s flavorful and isn’t loaded with salt, the way storebought stocks are. 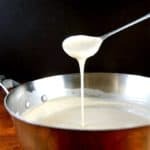 — You can make this recipe in a 12-inch cast iron skillet, which also makes for a nice presentation. It also means you have one less casserole dish to clean. –Add 1 cup finely chopped mushrooms to the stuffing, if you love them. 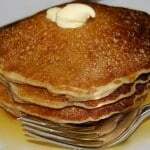 They add wonderful meatiness, and punch up the health factor. 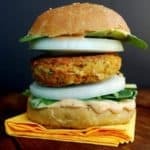 –I used whole wheat bread to keep this recipe as healthy as possible, but you can use any bread. Gluten-free is fine too. Make sure the bread is very dry when you add it to the stuffing so you don’t get soggy bread in your stuffing. — Serve this stuffing alongside my Chipotle Green Beans, Scalloped Sweet Potatoes with a crunchy pecan topping, easy French Apple Tart, and an entree like my Vegan Mushroom Lasagna or Mushroom Pot Pie. And perhaps, a crusty dinner roll. Then sit back and get all the thanks. Place the bread cubes on a baking sheet. Sprinkle on some salt and pepper and the 1/2 tsp each of sage and thyme. Spray with cooking spray and toss well to mix. 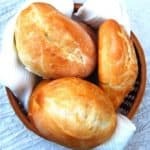 Bake for 10 minutes or until the bread is quite dry. On another baking sheet place the tater tots and bake them also for 10 minutes or until they are almost crisped up all the way but not quite. In a skillet, heat the oil. 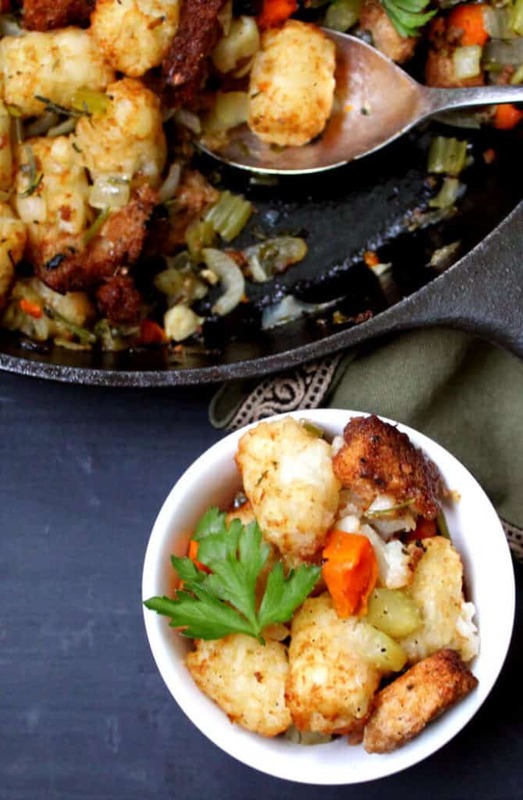 Use a cast-iron skillet if you have one that can go from the stovetop into the oven. Add the carrots, celery, onions and garlic. Season with salt and pepper and saute until the veggies turn very soft, about 10 minutes. Add the fresh herbs and mix them in. Add the vegetable stock and then the bread cubes and stir well to mix. Check seasoning and add more salt and pepper if needed. If you're not using an oven-safe skillet, transfer the stuffing to a casserole or baking dish. Cover with aluminum foil and bake 20 minutes. 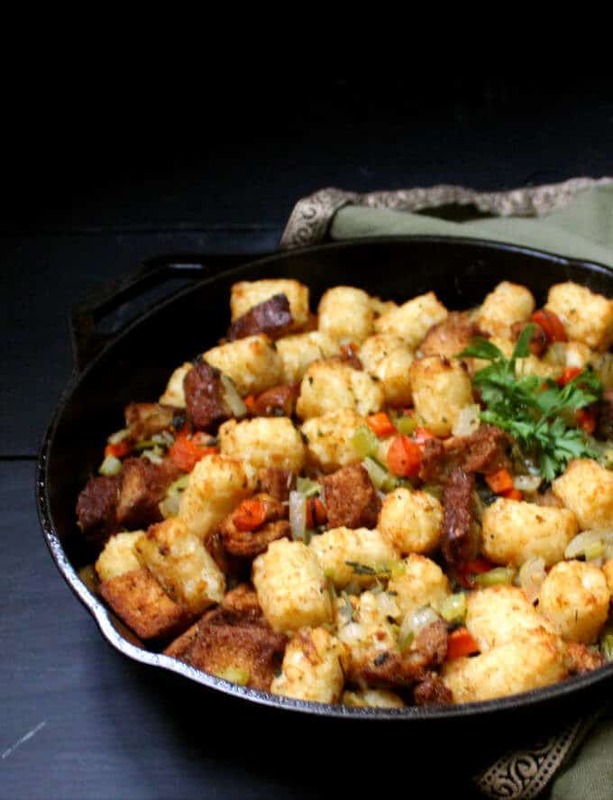 Remove the skillet or baking dish from the oven and stir in the tater tots. Increase oven temperature to 425 degrees. Place the skillet back in the oven for another 15 minutes, uncovered, or until the tater tots are crunchy. Remove from the oven and let stand at least 10 minutes before serving. Handle hot skillets with care. I used to be a good cook but many surgeries on my leg have made standing painful. 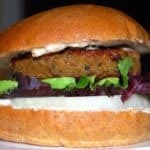 I’m mostly vegetarian now and looking for simple nutritious and delicious vegetarian meals and side dishes to prepare to get me interested in cooking again. 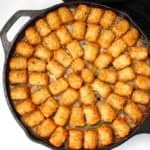 This TATER TOT recipe looks delicious. I’ll try it on Thanksgiving for me and my husband. Hope you try, Louise! Happy Thanksgiving. I tried this recipe last night to see how it would turn out, and you were right — the kids gorged on it!! It is fantastic, and one I will surely make again for Thanksgiving. THANK YOU!! Thanks for the recipe. I used cornbread I previously made. I dried it in the oven. Then I had the idea to add more veggies. 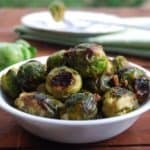 I took frozen brussel sprouts and sliced them thin. They’re easy to slice frozen and I added them to the pan right before putting it in the oven. It was the best stuffing ever!